As you may guess, the next arc’ll take the Breezy Pirates to Meme Island, to uncover Wyatt’s backstory. It’s also worth noting this is the penultimate major arc in the comic, and the beginning of Part 3…but there’s still several chapters remaining (about six, give or take a chapter) so no worries! Chapter 12 begins next Tuesday night/Wednesday morning, with filler coming up for this Friday’s update! hmmm, giant robots? been there, done that. Where to go next….. Wyatt! quit drawing on the walls…wait, Meme island, LETS GO THERE! Drawing? Nah, he’s vessel carving! Oops. I couldn’t see the knife when the picture was smaller. Vessel carving is by far one of the best hobbies to have. Shoot, thanks for bringing that up. I scanned this at a lower resolution than usual, and I guess that affected how I saved the file? (I use Photoshop’s Actions). Anyway it’s fixed now! ah, photoshop. It’s not my favorite program but it’s one of the best. I use a combination of photoshop, gimp, and an online editor for most of my stuff. Do you have any advise for a new webcomic I’m starting? 1) Launching: Don’t ever delay your comic’s launch because you’re worried it isn’t good enough. Just work out as many of the details as you can, set a launch date, and launch it on that launch date. Most of comics is about gaining experience while updating, anyways. 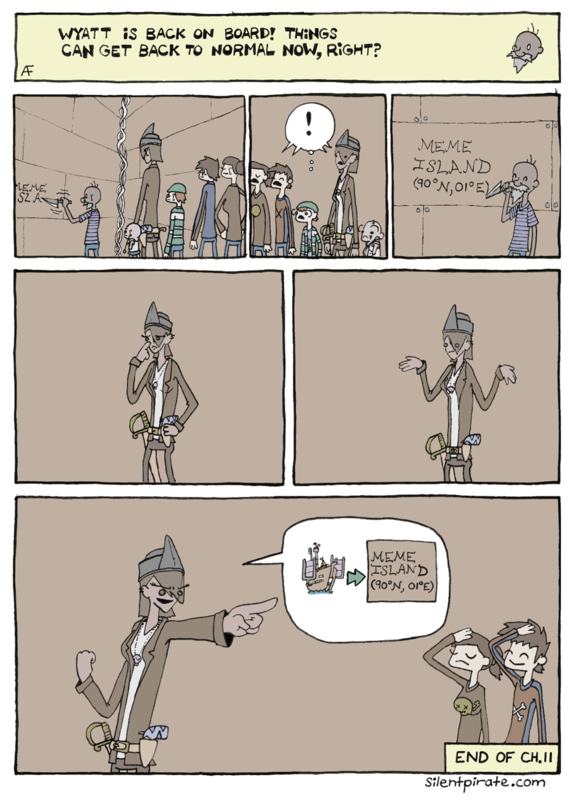 Just be aware: most first webcomics tend to look like first webcomics. It takes time to improve. For reference, this was the first page of my first webcomic, posted back in August 2008 (It burns my eyes whenever I look at it). 2) Hosting: there are free hosting sites out there, some of which come with their own built-in audiences. This might be a good place to gain experience without any cost. The best of the free sites I’ve seen is The Duck and Smackjeeves. You could also go the self-hosted route if you’d like, as it’s more professional, just know that it’ll probably cost you somewhere between $100-200 dollars a year for a good host, and you’ll have to build an audience from scratch. I use DreamHost for Silent Pirate. 3) Building a Readership: I am kind of bad at this, as most of my readership is due to my being part of the SpiderForest webcomics collective. However, advertising (use Project Wonderful) and drawing guest comics are effective for getting new readers. –Blambot has some nice fonts, both for free and not so free. –DeviantArt is great for finding art tutorials and Original Character Tournaments. Also, there’s a book called How to Make Webcomics written by four established webcartoonists (Scott Kurtz, Kris Straub, Brad Guigar, Dave Kellett) that may be worth picking up (I read it when I was first starting out). I didnt know you are the artest of anitsoshell! It makes sense now that i think about it though. This isnt my *first* webcomic but my other one was stick figures and I wasnt commited to it so it rarelly got updated. The one Im starting now is actually a story and Im hoping that Ill be motivated enough to keep it going. Thank you for the advise, Im possitive it wil help. I’ve also given some thought to a webcomic as well! Granted, it would be my first, but still. But if I was to start one Lyric, I would partner up with a close friend or someone who could help with story/art/computer issues, or something you and your partner both come up with! It’s just a thought, but the extra support can always help. By the way, what is a Original Character Tournament? An Original Character Tournament is a DeviantArt user-hosted event where artists are given a basic plot, and have to create characters that fit into that plot (so for a Pokemon-themed OCT, for example, they’d create their trainer, and a mythology-themed OCT would require a god/goddess character). Then the contestants have their characters battle via comics, and the person with the best comic moves on to the next round. I’m thinking I’d like to enter one of them actually, one that allows the artist to choose three of their own characters from their other comics and fight alongside them, but the deadline’s coming up soon and I haven’t started yet. It’s great practice, though. That sounds incredible! I’d love to enter, but that deadline is awfully close…Sounds like great fun! I imagine she would be using a sextant, since we are all at sea now, so minutes would be involved…. Wait…. is there anything other than sextants used at sea for maps & such? Penultimate? Wow…sounds exciting! So much more pirate shenanigans to see. I’m wondering, have you ever given thought to what you would do when Silent Pirate is finished? I have an idea for what I’ll do, though the concept is going to be a lot trickier for me to pull off. In a word: detectives. I’m thinking I might actually launch a production blog for it soon. Space detectives? Time-traveling detectives? Time-traveling space detectives? Time-travelling space Problem Sleuth Detectives! Their final battle will be against Lord Marvin English the Martian, who has turned into a fractal mobster demon thing! The Problem Sleuth gang, the Midnight Crew, and The Felt have teamed up to solve the greatest murder mystery the universe has ever known!